If you’ve got your eye on a reward but don’t have enough Skywards Miles in your account, simply buy more Skywards Miles. Whether you’re within touching distance of a reward flight or you’d like to splash out on an upgrade, get there faster. It costs just USD 30 per 1,000 Miles and you can buy up to 100,000 Skywards Miles in a year. The next time you want to spoil a loved one, buy Skywards Miles for family and friends, and let them treat themselves. From flights or even hotel stays, they’ll find something to indulge in from our range of tempting rewards. The price of 1,000 Skywards Miles is USD 30 and you can gift up to a maximum of 100,000 Miles in a year. If you can’t quite reach a particular reward, transfer your Skywards Miles to family or friends so you can combine them in one account and make your Miles go further. You can transfer Miles at a cost of USD 15 per 1,000 Miles and you can transfer up to a maximum of 50,000 in a year. If any of your Skywards Miles have expired in the past 6 months, you can reactivate them so that they are added back into your account. It costs just USD 20 per 1,000 Miles and you can reclaim up to 50,000 Skywards Miles in a year. If any of your Skywards Miles are expiring soon, you can extend their validity for up to 12 months. For just USD 20 per 1,000 Skywards Miles, you can purchase the extension 3 months prior to the date of expiry, and you can extend up to 50,000 Skywards Miles in a year. It may take up to 48 hours for the Miles to reflect in your account and be available to redeem. The validity of Skywards Miles that are due to expire or have expired can be extended or reinstated only through emirates.com. 2. All Buy Miles, Gift Miles, Transfer Miles, Extend Miles, Reinstate Miles transactions are processed and payments for the same are collected and processed by Points.com Inc.
4. Emirates Skywards strongly recommends that the Emirates Skywards Member reads the terms and conditions. 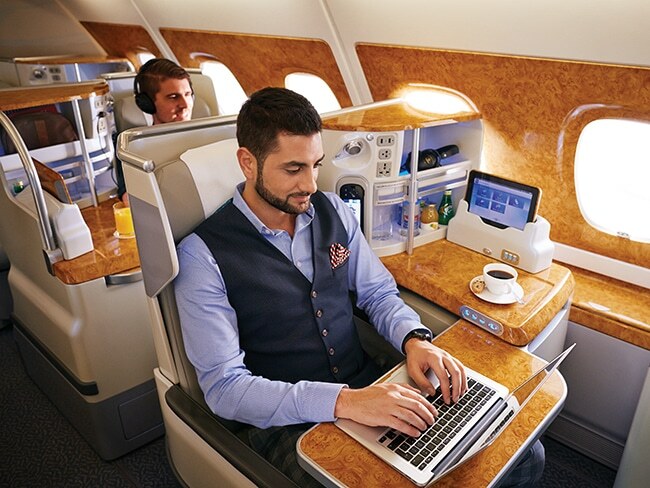 By utilising the Points Platform, the Emirates Skywards Member is agreeing to abide by the terms and conditions imposed by Points.com Inc. with respect to use of the Point Platform, including payment of all amounts when due and compliance with all rules and restrictions applicable to the use of the Platform. 5. Skywards Miles can be bought, gifted, transferred, extended or reinstated by Skywards Members via the Points.com Inc. platform (“Points Platform”) who have at least one prior earning activity in his or her Emirates Skywards Account, earned by flying on Emirates or a Partner airline or through a Partner transaction (“Eligible Skywards Member”). Personal Detail Bonuses do not qualify as accruals for this purpose. 6. Skywards Miles can be bought by an Eligible Skywards Member via the Points Platform for their personal use (“Buy Miles Standalone”) or as a gift to another Eligible Skywards Member (“Gift Miles”) in blocks of 1,000 Miles and at the cost of USD 30 per 1,000 Miles with 2,000 Miles as the initial minimum purchase. From time to time, eligible members will be given the option to top-up their Skywards Miles balance when falling short of the Miles required for booking an Emirates Flight Rewards or an Emirates Upgrade Rewards on emirates.com (“Buy Miles In-line” and together with “ Buy Miles Standalone”, “Buy Miles”). Such members can Buy Miles In-line in blocks of 1,000 Miles and at the cost of USD 30 per 1,000 Miles with 1,000 Miles as the initial minimum purchase. 100,000 Miles in a calendar year is the combined maximum a member can purchase for self through the Buy Miles products and receive as a gift through the Gift Miles product. Tier Miles cannot be bought or gifted. 7. Skywards Miles can be transferred by an Eligible Skywards Member to another via the Points Platform (“Transfer Miles”), in blocks of 1,000 miles and at the cost of USD 15 per 1,000 Miles. 2,000 Miles is the initial minimum purchase and the maximum transfer that can be sent and received by a member is 50,000 miles in a calendar year. Tier Miles cannot be transferred. 8. Skywards Miles that are due to expire within the next three (3) months can be extended for an additional validity of 12 months from the date of the original expiry by an Eligible Skywards Member via the Points Platform (“Extend Miles”) at the cost of USD 20 per 1,000 Miles. Skywards Miles that have expired within the last six (6) months can be reinstated for an additional validity of 12 months from the day of purchase by an Eligible Skywards Member via the Points Platform (“Reinstate Miles”) at the cost of USD 20 per 1,000 Miles. 1,000 Miles is the initial minimum purchase and the maximum that can be purchased by a member for extending and reinstating is 50,000 miles in a calendar year. Tier Miles cannot be extended or reinstated. 9. The price of Skywards Miles and the rules associated with buying, transferring, extending and reinstating Skywards Miles and/or conditions of obtaining Skywards Miles at any time are subject to change. 10. Skywards Miles bought/ gifted/ transferred are valid for a minimum of 3 years from the date of the purchase transaction and will expire at the end of the receiving member’s month of birth on the third year. Skywards Miles extended are valid for 12 months from the original expiry date and will expire at the end of such period. Skywards Miles reinstated are valid for 12 months from the date of purchase and will expire at the end of such period. 11. Skywards Miles can be bought, gifted and transferred through emirates.com and through the Emirates Contact Centre, Emirates Reservation and Ticketing office. Skywards Miles can be extended and reinstated online only through emirates.com and not through the Emirates Contact Centre, Emirates Reservation and Ticketing office. 12. Members will only be able to use a credit card to complete payments to Buy Miles, Gift Miles, Transfer Miles, Extend Miles and Reinstate Miles. Cash payments are not allowed. 13. Emirates Skywards Members are required to log in to their Emirates Skywards Account on emirates.com before being transferred to the Points Platform to complete the transaction. 14. Transactions will be processed in a currency based on the Country of Residence mentioned in the Skywards Member’s membership profile. Where payments are made in any currency other than U.S Dollars, the exchange rate applied may vary from the live exchange rate. In cases where payment in the member’s local currency is not supported, the transactions will by default be processed in U.S Dollars. Local taxes may be levied and payable as per the policies of Emirates. 15. Skywards Miles will be credited to the Emirates Skywards Account within 48 hours after full and successful payment is settled by credit card via the Points Platform. In the event of Skywards Miles not being posted to the Account, Skywards Miles can be claimed by contacting an Emirates Contact Centre. 16. Skywards Miles can be bought, gifted and transferred at any time while Skywards Miles can be extended within the last three (3) months prior to expiry and reinstated within six (6) months after expiry. 17. Skywards Miles can be bought, gifted, transferred, extended and reinstated within the prescribed limits and must be purchased at least 48 hours prior to making a booking/redemption. Any transaction made to Buy Miles (whether through Buy Miles Standalone or through Buy Miles In-line ), Gift Miles, Transfer Miles, Extend Miles and Reinstate Miles with the intent of redeeming such Skywards Miles for Rewards doesn’t guarantee the availability of such Rewards. Refunds in respect of Skywards Miles purchased are not permitted, unless required by law. 18. A Member may not sell his or her Skywards Miles for cash or other consideration and a Member may not purchase Skywards Miles from a third party. 19. If the recipient of any Skywards Miles is not a Skywards Member, the recipient must enrol in Emirates Skywards prior to being able to receive any such Skywards Miles. 20. Skywards Miles that are bought, gifted, transferred, extended or reinstated do not count toward Tier status. 22. Emirates Skywards Programme Rules(Opens link) apply.